After a few hours in boat, you’ll arrive at Chile Chico, a border town with various offerings for lodging, restaurants, and other services. Today, we invite you to visit the Jeinimeni sector of Patagonia National Park, which features beautiful steppe landscapes, rock formations, the Moon Valley, and the gorgeous Lake Jeinimeni, which is surrounded by Lenga forests. To get to the park, take the road to the border and, around 1.2 miles from the Chile Chico town square, take a right on Route X-753 (toward the aerodrome). At kilometer 25 (mile 15.5), you’ll arrive at the Piedra Enclavada sector. This sector is the starting point for circuit hike that reaches a 130-foot-tall volcanic rock formation, visits a small, rocky cave where you can see vestiges of the Tehuelche people’s life here, and finally ends in the beautiful Moon Valley. The complete circuit takes around 4 hours. Continue until you reach kilometer 65 (mile 40) of Route X-753, where you’ll find the stunning Lake Jeinimeni, and from which you can set out on various hiking trails, including the Escorial del Silencio Trail, the Mirador del Lago Trail, and the Laguna Esmeralda Trail. In this sector, you’ll also find picnic sites and campsites. You can stay here for the night or head back to Chile Chico. Once you’ve finished your visit, take the exit south to Bajo Caracoles, which is 29 miles away. We suggest tanking gas here as you won’t have access to another gas station until Cochrane. From Bajo Caracoles, take Route 41 west for around 2.5 hours, until you arrive at the border crossing. Once you’ve crossed through the Argentinian and Chilean control points, it’s around a 1.5-hour trip until you arrive at the administrative offices of Patagonia National Park, though at kilometer 45 (mile 28) along Route X-83, you’ll see the first camping area (Alto Valle). The second camping area is located at kilometer 25/mile 15.5 (Casa de Piedra), and the final camping area is 1.25 miles from the administrative center and also features two lodges, which require prior reservations. You can stay in one of the campsites or in a nearby town, such as Cochrane, which is located around 17 miles away. Dedicate this entire day––at least––to exploring the various trails of Patagonia Park, although ideally, we suggest leaving at least two days for this. Whether you stay in the park or in a nearby town like Cochrane, you’ll have access to a network of trails, and you can choose which to hike based on the weather, your fitness level, and the total amount of time you have available to spend in the park. One can’t-miss route for seasoned hikers is the Lagunas Altas trail, a 14-mile hike that features 7 lagoons and spectacular views of the Chacabuco Valley, where you can see the Patagonian steppe in all its splendor. There are also easier hikes, such as La Vega, which takes 15 hours and also offers an opportunity to appreciate the beauty of the Chacabuco Valley, a natural corridor long used by native groups as well as a large diversity of fauna. Stay the night in Patagonia Park or in Cochrane. If you’re out of time, go back to the Carretera Austral, which will take you to the city of Cochrane. There, you can tank gas and visit the Tamango sector, where you’ll find a wide variety of trails and campgrounds that provide a great opportunity to take in the beauty of the river and Lake Cochrane. One option is to take a detour on Route X-901 to see the majesty of the Calluqueo Glacier on Mount San Lorenzo, or visit the Los Ñadis sector, which is located 28 miles south of Cochrane. There, you’ll also find the “Corte San Carlos,” which has been declared a National Historical Monument. Finally, you can also visit Tortel, a town made of boardwalks built from Ciprés de las Guaitecas (Pilgerodendron), located just at the mouth of the Baker River. Board the ferry and get ready to enjoy your first night exploring the Patagonian Channels. Today, you’ll wake up near Bernardo O’Higgins National Park. Come out from below deck and take in the incredible views of the fjords and channels, long explored by the Kawésqar people, who rowed through them in boats made from Coigüe bark and covered in vegetable fibers. One you cross through the English Narrows, you’ll dock around midday at Puerto Edén, a town located just south of the Gulf of Penas, which has the highest concentration of Kawésqar descendants of any town. Depending on the weather and the tides, you’ll have around two hours to explore this port’s boardwalks and gorgeous lookout points. Go back to the ferry and continue your voyage south through the Patagonian Channels, taking in the beauty of these pristine landscapes. Enjoy your final morning in the ferry, which will now be traveling through the area near Kawésqar National Park. You’ll pass the entrance to the Montañas Fjord and through the Kirke Narrows––the narrowest passage of the entire voyage––and then dock in Puerto Natales in the afternoon. In Puerto Natales, you’ll find a variety of options for lodging, food, and tourist excursions. To stretch your legs after the trip in ferry, we recommend walking the road along the shoreline. On clear days, you’ll be able to spot the Paine Massif. Stay in Puerto Natales for the night. Get ready to see the Eighth Wonder of the World and one of the most beautiful mountains on the planet in Torres del Paine National Park. We suggest taking Route Y-290 to the park and stopping at the Milodón Cave Natural Monument before continuing toward the park’s southern entrance (Serrano). The total route is 50 miles. We recommend taking this day to explore the southwestern section of the park, visiting natural marvels like the Grey Glacier, the River Pingo forest, and the view from the Ferrier lookout point. You can also make a stop at the visitor’s center, located on the north shore of Lake Toro. The visitor’s center has a lookout point designed for birdwatching. You can stay in the park (there are various hotels and campgrounds, which should be reserved in advance), or return to Puerto Natales in the evening. Set aside a whole day––at least––for exploring Torres del Paine National Park. We suggest using this day for exploring the northeastern side of the park, visiting the Grande and Chico waterfalls and hiking one of the trails that offer views of the beautiful colors of the Paine River, Lake Pehoé, and Lake Nordenskjöld, like the Mirador Cóndor or Mirador Cuernos trail. If you’d like to take some time to try to spot wild fauna, you can also hike the Portería Laguna Sarmiento–Laguna Amarga trail and visit Lake Sarmiento. Along Lake Sarmiento’s shore, you can find strange, primitive calcium carbonate formations––very similar to coral––called thrombolites, which are linked to the first expressions of life on our planet. Stay in the park for the night (remember to make your reservations in advance) or return to Puerto Natales. Head to Punta Arenas, passing through the town of Cerro Castillo along the way. If you leave the park at dawn, you can see the Torres del Paine reflected in the Laguna Amarga or Laguna Azul––a gorgeous spectacle of nature’s beauty. You can tank gas in Puerto Natales, then continue along Route 9 for around 2.5 hours until you reach Punta Arenas, which has a wide variety of restaurants and hotels. Before continuing on to your next destination, take some time to explore Punta Arenas, whether that’s walking along the shore to admire the beauty and history of the Strait of Magellan, visiting some of the museums––such as the Salesiano, Sara Braun, or Nao Victoria Museum––or exploring the Municipal Cemetery or the Magallanes National Reserve. From Chile Chico, you can get to Patagonia Park without crossing into Argentina if you take Route CH-265 toward Guadal and then drive to the Carretera Austral. If the Lake General Carrera ferry crossings don’t work with your schedule, you can get to Patagonia Park from Coyhaique along the Carretera Austral (a 7-hour drive, approximately). Another option is to make a stop in Puerto Tranquilo. From Los Antiguos to the Roballos Pass, you also have the option of taking Route 41, which doesn’t give you the opportunity to stop at the Cueva de Manos but is more direct and also has beautiful scenery. Be careful and make sure to check on the road’s status before starting your trip; the road is frequently closed, especially in the winter months. Another alternative for getting to Torres del Paine from the Aysén Region without taking the ferry is to drive south through Argentina on Route 40. You’ll pass through towns including Gobernador Gregores and Calafate, and finally cross the border into Chile at the Río Don Guillermo Pass, located in Villa Cerro Castillo, 217 miles from Calafate. 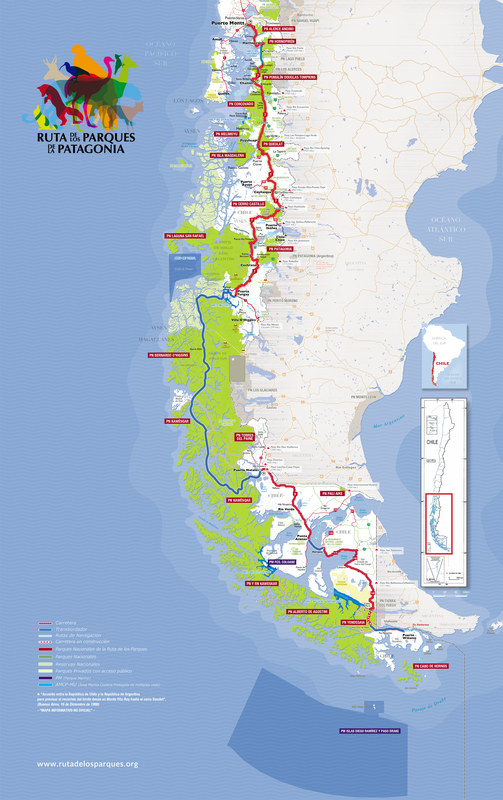 You can also do this route in the opposite direction, beginning at Puerto Natales and traveling to Puerto Yungay. Torres del Paine has various trekking circuits that take between 5 and 8 days (the “W” and the “O”). One option is to extend your stay in the park in order to complete one of the circuits and explore the areas around the Paine Massif. Sky and LATAM Airlines have daily flights to Balmaceda, located 34 miles southeast of Coyhaique. You can get to Chile Chico via the Carretera Austral, driving 236 miles from Coyhaique, or driving 72 miles to Puerto Ibáñez and then taking the 2-hour ferry trip across Lake General Carrera. Various airlines offer daily flights to Punta Arenas. Dap Airlines flies twice a week between Balmaceda and Punta Arenas. The direct flight from Santiago to Punta Arenas takes 3.5 hours. Be sure to bring at least one spare tire. There are gas stations in Chile Chico, Los Antiguos, Perito Moreno, Bajo Caracoles, Cochrane, Puerto Natales, and Punta Arenas. If you’re driving a rental car and want to cross into Argentina, don’t forget to include the required insurance and the authorization for crossing the border in the rental agreement. For more information about the ferry from Puerto Yungay to Puerto Natales and to check the schedules, visit: http://www.tabsa.cl/portal/index.php/es/horarios/318-horario-yungay-natales. The ferry has seats, bathrooms, showers, and food service, and your ticket includes breakfast, lunch, and dinner. ●	The entry fee to Torres del Paine National Park costs $11,000 CLP for Chileans and $21,000 CLP for foreigners. You can buy it online at: http://www.parquetorresdelpaine.cl/es/tarifas-de-ingreso. The campsites and mountain cabins along the trekking circuits in Torres del Paine must be reserved in advance. You can make reservations up to 6 months in advance (the system does not allow for reservations more than 180 days in advance). The reservation system at www.parquetorresdelpaine.cl is only for the free campsites managed by Conaf (the park rangers). At www.verticepatagonia.cl and www.fantasticosur.com, you can find out more about the campsites managed by private companies. The road between Puerto Natales and Cerro Castillo (near the Río Don Guillermo border crossing) is paved. The road between Puerto Natales and Punta Arenas is paved. Kawésqar National Park is one of the largest parks in the world and the second-largest in Chile.